Consumer networking companies love to come up with new terms to entice shoppers. And so it is that D-Link has birthed (and trademarked!) its new Amplifi line. The product video makes the hyperbolic claim that the Amplifi's are "the only brand of premium-engineered routers on the market that empower your devices to always exceed your expectations". With a nod to the current trend of trying to get consumer to once again try powerline networking, the line includes a few products using Qualcomm-Atheros' 500 Mbps HomePlug AV compatible technology. But my focus today is on the first Amplify product to hit the shelves, the DIR-657. The 657 takes the minimalist approach of Cisco's E-series and Belkin's N750 DB and has only two lights as shown in Figure 2. Antennas are internal and there are no mounting slots on the bottom. The back panel is where you find the five Gigabit Ethernet ports, one WAN and four switched LAN, a USB 2.0 port supporting D-Link's SharePort Plus for sharing printers and drives, power socket and recessed reset button. I'm surprised that D-Link included a power button, given its focus on manufacturing cost reduction that eighty-sixed most of the indicators. A look below the front panel lip reveals another sharing feature, an SD card slot that SharePort can also serve up files from. 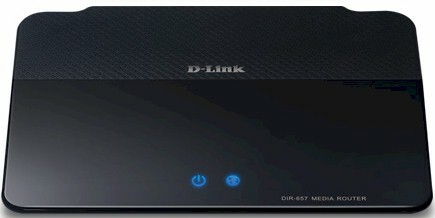 D-Link used to base most of its routers on Ubicom's CPUs. This endowed them with Ubicom's StreamEngine automatic QoS, which D-Link likes to call Game Fuel or HD Fuel, depending on the buyer they're targeting. The 657 is the first new router in awhile to use a Ubicom CPU, an IP7160U to be specific. This is mated with 128 MB of RAM and 16 MB of flash. The board shot in Figure 5 taken from the FCC ID docs shows the sheet metal antennas that stand proud of the board at the photo front right and rear left and has the shield over the CPU, radio and memory chips removed. The ceramic heat spreader is still mounted on the Atheros AR8316 Gigabit Ethernet switch and the SD card reader is at the lower right of the picture. The closeup in Figure 6 reveals enough detail to see the chip manufacturers. But I had to resort to taking my review sample apart (after testing was done) to ID the Atheros AR9227 as the 2.4 GHz 2x2 N radio and determine the actual RAM and flash amounts. I looked, but couldn't find any information about the AR9227. Seems that Qualcomm is less generous about providing details about its products than Atheros was, at least to general internet passers-by.